Secretary of State Mike Pompeo, the former CIA director, and CIA official Andrew Kim, the pair on the left, have dinner with North Korea's Kim Yong Chol, a former intelligence chief, in New York on Wednesday. Current and former spy chiefs are playing an unusually prominent role in arranging a proposed summit between President Trump and North Korean leader Kim Jong Un. Secretary of State Mike Pompeo and CIA official Andrew Kim, both at right, meeting with North Korean leader Kim Jong Un on May 9 in the capital Pyongyang. He didn't name that senior leader, but was referring to Andrew Kim, a Korean-American who grew up in South Korea. President Trump was clearly impressed with Pompeo's initiative on North Korea, and sent him there — reportedly with Andrew Kim — on a secret trip in April to lay the groundwork for the possible summit between Trump and North Korean leader Kim Jong Un. If the summit happens, it would be the first meeting between leaders of the two countries. The CIA is often involved behind the scenes in the run-up to a presidential summit. But U.S. and Korean spy chiefs are playing an unusually prominent role when it comes to the summit. Pompeo "obviously demonstrated something very unique to the president. He took the lead on operating the North Korea issue, which he's doing right now," said Joseph DeTrani, a former CIA officer who was President George W. Bush's special envoy for nuclear negotiations with North Korea from 2003-6. After Pompeo became secretary of state a month ago, he made a second trip to see Kim Jong Un in North Korea. 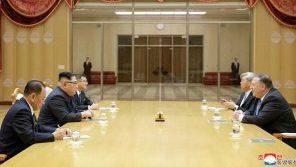 In the photo of that Pompeo-Kim meeting on May 9, the lone American sitting next to Pompeo is the CIA's Andrew Kim. Laura Rosenberger has some reservations about the prominence of intelligence officials in these negotiations. She worked on North Korean issues at the National Security Council and at the State Department. She even visited a North Korean nuclear site a decade ago during an earlier moment of diplomatic optimism. "The policy process should not be being driven by the intelligence community," said Rosenberger, now a senior fellow at the German Marshall Fund of the United States, in Washington. "The State Department has been in the lead for those [previous] negotiations. So even though we don't have diplomatic relations [with North Korea] we still have the ability to have those kinds of channels," she added. To be clear, the State Department is deeply involved in the current summit preparations. Yet Pompeo and Andrew Kim were together again in New York at a dinner on Wednesday night and in talks Thursday with North Korea's Kim Yong Chol. He's a former intelligence chief himself, and is considered the right-hand man of Kim Jong Un. Pompeo and Kim Jong Chol plan to meet again in Washington on Friday. Pompeo said Kim Jong Chol will deliver a letter from Kim Jong Un to Trump. On the South Korean side as well, the point man for the summit is the country's national intelligence chief, Suh Hoon. He has organized all three meetings between South Korean and North Korean leaders — in 2000 and 2007, as well as the most recent one in April. So all these spies are in the mix. But how good is the U.S. intelligence on North Korea? "We are still suffering from having gaps," Pompeo acknowledged in his speech back in January. "These are difficult target sets. I'll concede that at the outset. But it's completely inadequate for the CIA to say, 'Well, that's a hard problem.' Of course it's a hard problem. That's why you pay us." Bruce Bennett of the Rand Corporation said important information about the North's nuclear program remains fuzzy. "The key question on nuclear weapons is how many uranium enrichment facilities have they had. We don't know," said Bennett, who has traveled to South Korea more than 100 times and closely follows North Korea. And how many nuclear weapons does North Korea have? "Some of the key experts are talking about somewhere in the neighborhood of 15 to 40 nuclear weapons. There have been press reports that the intelligence community is talking about 30 to 60," he added. "I think we have to recognize the uncertainties." By comparison, the U.S. knew much more about Iran's nuclear program when those negotiations took place. Many details were collected by international inspectors, who haven't been allowed inside North Korea in years. Iran reached a nuclear deal with world powers in 2015. Trump pulled out of the deal in May, though the other parties involved remain committed to the agreement for now. So what are the prospects of a breakthrough with North Korea? "I'm guardedly optimistic. I think Kim Jong Un has made a strategic decision to pursue talks," said DeTrani, the former CIA officer. "I don't think it has to be a long, drawn-out process. I think there are things that could be done in a relatively short period." He cited a formal end to the 1950-53 Korean War; establishing diplomatic missions in each country; and economic development for North Korea. In turn, North Korea could make a full declaration of its nuclear facilities and allow international inspections. The ultimate prize, a full-fledged nuclear deal, would take more time, he added. Laura Rosenberger is more skeptical. "The North Koreans have shown us before a willingness to take symbolic, reversible steps, to pocket rewards, and then cheat and walk away. And that is a trap we need to avoid," she said. She notes that Kim Jong Un — who's rarely invited to meet other leaders — has improved his international standing recently by twice meeting China's President Xi Jinping, twice meeting South Korea's President Moon Jae-in and twice sitting down with Pompeo. "One of the things that the North Koreans want most is legitimacy, and essentially, Kim Jong Un already has gotten that," she said. Persuading him to give up his nuclear weapons — or just declaring how many he has — will be a long, difficult process, she said. All right. So we are not sure yet whether President Trump and North Korean leader Kim Jong Un are going to actually meet, but U.S. and Korean spy chiefs are set to have more face time today. And they have been playing leading roles in this yes-no-maybe summit. Here's NPR's Greg Myre. GREG MYRE, BYLINE: When Mike Pompeo became CIA director last year, he immediately placed his focus on North Korea. MIKE POMPEO: Within weeks of me coming here, I created a Korean Mission Center, stood it up with a senior leader who had just retired, brought him back to run the organization. MYRE: Pompeo, speaking back in January, was referring to Andrew Kim, a Korean-American who grew up in South Korea. Since then, Andrew Kim has accompanied Pompei on two trips to meet North Korean leader Kim Jong Un. 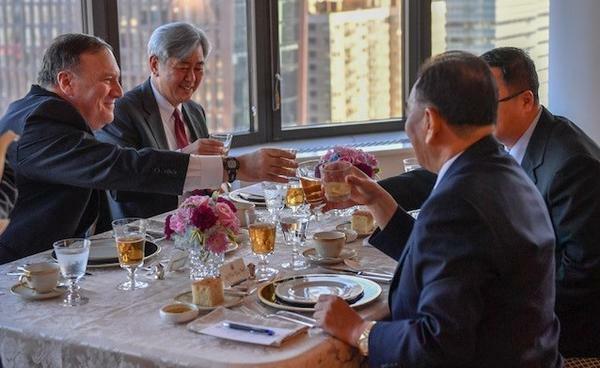 Pompeo and Andrew Kim were also side by side as they dined Wednesday and held talks Thursday in New York with North Korea's Kim Yong Chol (ph). He's a former intelligence chief himself and considered the right-hand man of Kim Jong Un. LAURA ROSENBERGER: The policy process should not be being driven by the intelligence community. MYRE: Laura Rosenberger says that's the job of the White House and the State Department. She worked on North Korea as a diplomat. She even visited a North Korean nuclear site a decade ago. ROSENBERGER: The State Department has been in the lead for those negotiations. So even though we don't have diplomatic relations, we still have the ability to have those kinds of channels. MYRE: To be clear, the State Department is deeply involved in summit preparations. But U.S. and Korean spy chiefs, current and former, are playing an unusually prominent role says Bruce Bennett of the RAND Corporation. BRUCE BENNETT: If you're talking about North Korea's nuclear capabilities, that's not going to be something that the State Department is going to have the lead on. That's going to be something that the intelligence community has the lead on. MYRE: So all these spies are in the mix, but how good is the U.S. intelligence? BENNETT: The North Koreans are very, very good at hiding information about their programs. MYRE: Bennett says crucial details remain elusive. BENNETT: Some of the key experts are talking about somewhere in the neighborhood of 15 to 40 nuclear weapons. There have been press reports that the intelligence community is talking about 30 to 60. I think we have to recognize the uncertainties. MYRE: And what are the prospects for a breakthrough? Laura Rosenberger offers this warning. ROSENBERGER: The North Koreans have shown us before a willingness to take symbolic reversible steps to pocket rewards and then cheat and walk away. And that is a trap we need to avoid. MYRE: She notes Kim Jong Un has substantially improved his image by meeting the presidents of China and South Korea as well as Pompeo. ROSENBERGER: One of the things that the North Koreans want most is legitimacy, and essentially, Kim Jong Un already has gotten that. MYRE: Much harder, she says, will be getting him to give up those nukes. Greg Myre, NPR News, Washington. Transcript provided by NPR, Copyright NPR.